Learn about golden greek tortoise care, Ibera greek tortoise care, greek tortoise diet, greek tortoise housing and more. Naturally found in North Africa, southwest Asia and southern Europe, the Greek tortoise inhabits a variety of spaces. Rocky hillsides, Mediterranean scrub, forests, fields and meadows are all occupied by the tortoises according to subspecies. Some habitats are particularly arid. A highly domed carapace joins the singly hinged plastron by a thick bridge. Its colors are yellow-gold to dark brown or black. Flecks, borders, rays and spots on the shell produce a pattern reminiscent of a Greek mosaic, hence the name â€œGreek tortoiseâ€. One to three raised scales, spurs or tubercles are located at either side of the tail on each thigh. This gives way for a second name, “Mediterranean spur-thigh tortoise”. The head is blunt with large eyes and the arms exhibit large scales and thick, powerful claws. The supracaudal shield just above the tail is undivided. Over the last few decades, many Greek tortoises, particularly ibera and Goldens were imported into the United States for the pet trade. Many of these animals harbored vicious parasites and diseases. Sadly, many did not survive. Those that received medical attention and appropriate care are now thriving in captivity. This â€œfounder stockâ€ has produced a high number of captive bred babies, some now grown up and producing offspring of their own. These USA born tortoises have proven to be an excellent choice for the reptile keeper and are quite rewarding. A rather responsive species, the Greeks have gotten raving reviews from those who have attempted to keep them long term, the right way. Depending on the subspecies, Greek tortoises are readily available. 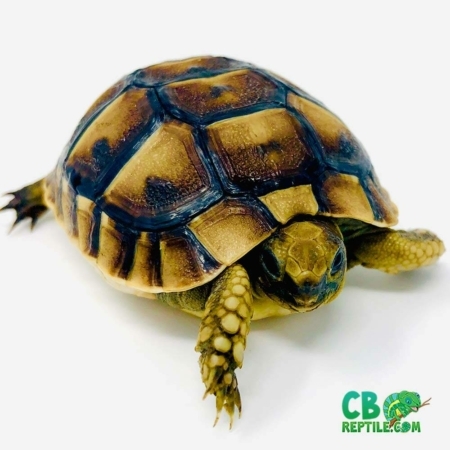 Forms such as the ibera Greek and now the Golden Greek have produced well under captive conditions and healthy hatchlings can be found at reptile expos, reliable pet stores, online dealers and private breeders. Throughout the year, one can usually locate babies available for sale with ease. Keepers should be strongly advised to refrain from buying freshly imported Testudo graeca from the wild. These specimens are brought over in droves and are typically offered for sale in spring and late summer. Only the very experienced should attempt to take on such a challenge. As always, buy captive bred over wild caught. We have captive bred golden greek tortoise for sale, ibera greek tortoise for sale, and other species of greek tortoise for sale as well. Our captive bred baby golden greek tortoises for sale are stunning as are our captive bred ibera greek tortoises for sale. These tortoises are typically a small to medium sized animal with some exceptions. Depending on subspecies, they will grow to between 5 and 8â€. Some examples of T. g. ibera will attain very large dimensions such as 10-11â€, but this is rare. Males are found to be the smaller of the sexes but again, there are exceptions. At hatching, most Greek tortoises are no more than an inch in length. They can grow rapidly when over fed and reports of them reaching 4â€ in less than two years is common but not recommended. Testudo graeca are known to be some of the longest lived of the tortoises. Reports suggest well into the 100s. In the wild, many do not live passed the age of twenty due to predation and other factors. When kept safe and under optimum conditions, they thrive and can live to a ripe old age. Some have outlived their keepers. Housing Greek tortoises outdoors in a naturalistic pen is always best. During the warmer part of the year, they can be kept in spacious enclosures that are well planted with edible vegetation and receive plenty of time in natural, full sun. 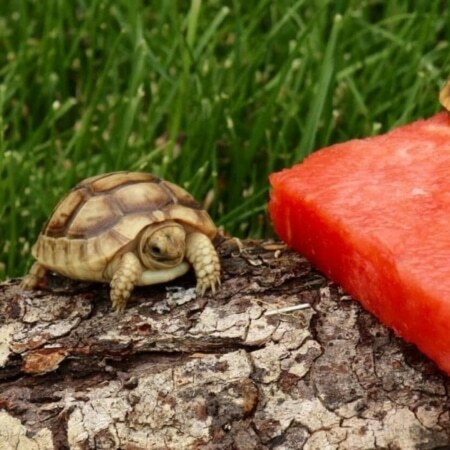 Indoors, the construction of a â€œtortoise tableâ€ will suit the needs of these creatures well. A 3 by 6 foot unit made of ply wood will suffice for a single adult and up to a pair of adults. Wood is always recommended over plastic or glass so that the tortoises cannot see out. This way they will learn their boundaries and it will lessen their attempts to escape. If the space is available, always go larger in size. This allows for a more natural behavior cycle and reduces stress especially from territorial or aggressive specimens. Males being housed together may pose a problem by fighting relentlessly, especially when females are present. Itâ€™s important to give the tortoises as much room as possible because they could be spending months on end indoors, until the weather outside is once appropriate for outdoor keeping again. As always, natural sunlight should be utilized whenever possible and the tortoises fully benefit in many ways from being exposed to it. When housing them inside, proper lighting is essential for keeping them healthy. Many options are available to us today such as daylight spot bulbs, infrared heat bulbs, fluorescent tube lighting and ceramic heat emitters. Mercury vapor bulbs which provide both UVA and UVB are a personal favorite of mine. A 100-150 watt vapor bulb is installed on one end only of the indoor unit and this makes for a perfect basking area. It also lights up the enclosure nicely. The opposite end should remain cool. You can also use a regular spot light for the basking area so long as it reaches a temperature of 95-100F. In this case, a fluorescent UVB emitting bulb will need to be installed as well. The ambient room temperature should remain between 75 and 85F. When raising hatchlings, a humidity level of between 65 and 70% is appropriate. This can be achieved by spraying down the enclosure every other day with warm water. A water dish in combination with a substrate that retains humidity well such as 50/50 top soil-play sand mix or cypress mulch does the trick as well. By keeping the babies well hydrated and at a sufficient humidity level, they will grow smoothly and keep good weight. Greek tortoises spend much of their time gazing on edible landscape. For this reason, it is an excellent and healthy idea to offer weeds such as Dandelion, clover, plantain, hawksbit, cat’s ear, wild strawberry, and thistle. When these items are not available like during the winter months, they can be replaced by dried, bagged organic herbs. These can be found online. Store bought greens like collards, mustards, kale and turnip can be offered sparingly. Commercial diets such as Mazuri are excellent for helping the tortoises maintain good weight but again should be offered only in moderation. Calcium supplements in the form of cuttle-bone are wonderful additions to their diet. The tortoises will gladly nibble on them as they feel the need and take in appropriate amounts. Many Greek tortoises derive from extremely arid habitats while others are found in more temperate locations. Regardless of their origin, they all need to stay hydrated. A shallow water dish should be available to them at all times for drinking and soaking and should be changed frequently. Tortoises defecate in water so keeping the supply clean is a must. They also appreciate occasional misting of their environment and may see it as â€œrainâ€. This prompts them to empty their bowels and drink. 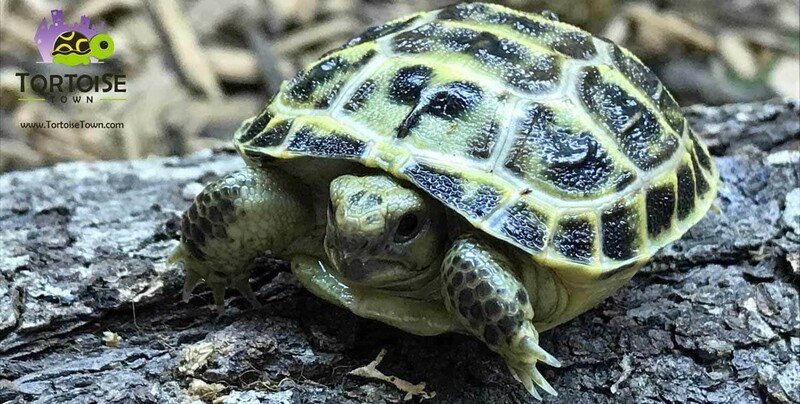 Male Greek tortoises will exhibit a classic behavior of â€œshell rammingâ€ in that they use their carapaces to slam into the females in order to coax them into breeding. Once the female submits to the maleâ€™s advances (he also viciously bites at her legs and face) he will mount her from behind and begin copulation. A series of high pitched squeaks are expelled from the maleâ€™s mouth as he sticks out his tongue during the mating process. This act of courtship generally takes place in April and May with egg laying commencing in June. The female digs a 4 to 7â€ flask shaped nesting chamber with her hind legs and deposits anywhere from 3 to 6 eggs but sometimes more depending on the subspecies. She then covers the nest and leaves the eggs to hatch on their own. I prefer to dig up the eggs and place them in artificial incubation. They are placed in closed deli cup containers on slightly moistened vermiculite and are incubated at between 84 and 88F. The higher temperature will result in females, the lower in males. At between 55 and 70 days, the baby tortoises will hatch. They are left inside the containers in the incubator until they straighten out and absorb their yolk sacs. They are then placed in their rearing enclosures for the first few years of life. Written by Chris Leone of GardenStateTortoise, LLC.